Budgeting is the tactical implementation of a business plan. To achieve the goals in a business’ strategic planCorporate StrategyCorporate Strategy focuses on how to manage resources, risk and return across a firm, as opposed to looking at competitive advantages in business strategy, we need some type of budget that finances the business plan, and sets measures and indicatorsKey Performance Indicators (KPIs)Key Performance Indicators (KPIs) are measures used to periodically track and evaluate the performance of a business or organization toward the achievement of specific goals. They are also used to gauge the overall performance of the company against other similar companies within the industry. of performance. We can then make changes along the way to ensure that we arrive at the company’s goals. There are four dimensions to consider when translating high-level strategy, such as mission, vision, and goals, into budgets. Objectives are basically your goals, e.g., increasing the amount each customer spends at your retail store. Then, you develop one or more strategies to achieve your goals. The company can increase customer spending through expanding product offerings, sourcing new suppliers, promotion5 P's of MarketingThe 5 P's of Marketing – Product, Price, Promotion, Place, and People – are key marketing elements used to position a business strategically. The 5 P's of Marketing, also known as the marketing mix, are variables that managers and owners control to satisfy customers in their target market, add value to their business,, etc. You need to track and evaluate the effectiveness of the strategies, using relevant measures. For example, you can measure the average weekly spending per customer and average price changes as inputs. Finally, you should set targets that you would like to reach by the end of a certain period. The targets should be quantifiable and time-basedSMART GoalA SMART goal is used to help guide goal setting. SMART is an acronym that stands for Specific, Measurable, Achievable, Realistic, and Timely. Goals are part of every aspect of life and provide a sense of direction, motivation, a clear focus, and clarifies importance. By setting goals for yourself, you are providing, such as an increase in the volume of sales or an increase in the number of products sold. Budgeting is a critical process for any businesses in several ways. The process gets managers to consider how conditions may change and what steps they need to take, while also allowing managers to understand how to address problems when they arise. Budgeting encourages managers to build relationships with the other parts of the operation and understand how the various departments and teams interact with each other and how they all support the overall organization. Communicating plans to managers is an important social aspect of the process, which ensures that everyone gets a clear understanding of how they support the organization. It encourages communication of individual goals, plans, and initiatives, which all roll up together to support the growth of the business. It also ensures appropriate individuals are made accountable for implementing the budget. Budgeting gets managers to focus on participation in the budget process. It provides a challenge or target for individuals and managers by linking their compensation and performance relative to the budget. Managers can compare actual spending with the budget to control financial activities. Budgeting provides a means of informing managers of how well they are performing in meeting targets they have set. A robust budget framework is built around a master budget consisting of operating budgets, capital expenditure budgets, and cash budgets. The combined budgets generate a budgeted income statement, balance sheet, and cash flow statement. Revenues and associated expenses in day-to-day operations are budgeted in detail and are divided into major categories such as revenues, salaries, benefits, and non-salary expenses. Capital budgets are typically requests for purchases of large assets such as property, equipment, or IT systems that create major demands on an organization’s cash flow. The purposes of capital budgets are to allocate funds, control risks in decision-making, and set priorities. 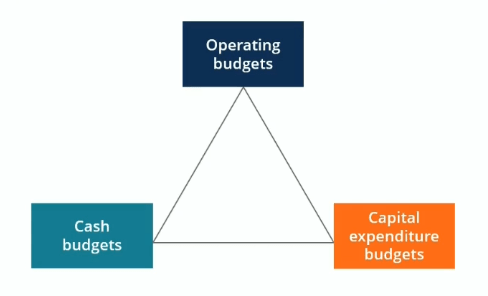 Cash budgets tie the other two budgets together and take into account the timing of payments and the timing of receipt of cash from revenues. Cash budgets help management track and manage the company’s cash flow effectively by assessing whether additional capital is required, whether the company needs to raise money, or if there is excess capital. The budgeting process for most large companies usually begins four to six months before the start of the financial year, while some may take an entire fiscal yearFiscal Year (FY)A fiscal year (FY) is a 12 month or 52 week period of time used by governments and businesses for accounting purposes to formulate annual financial reports. A Fiscal Year (FY) that does not necessarily follow the calendar year. It may be a period such as October 1, 2009 – September 30, 2010. to complete. Most organizations set budgets and undertake variance analysis on a monthly basis. Starting from the initial planning stage, the company goes through a series of stages to finally implement the budget. Common processes include communication within executive management, establishing objectives and targets, developing a detailed budget, compilation and revision of budget model, budget committee review, and approval.